Syracuse University representatives from the Institute for Veterans and Military Families (IVMF) and the Office of Veteran and Military Affairs (OVMA) recently traveled to Washington, D.C., for several employment-related events, including networking sessions, an alumni reception, a national conference, entrepreneurship training and an annual meeting. 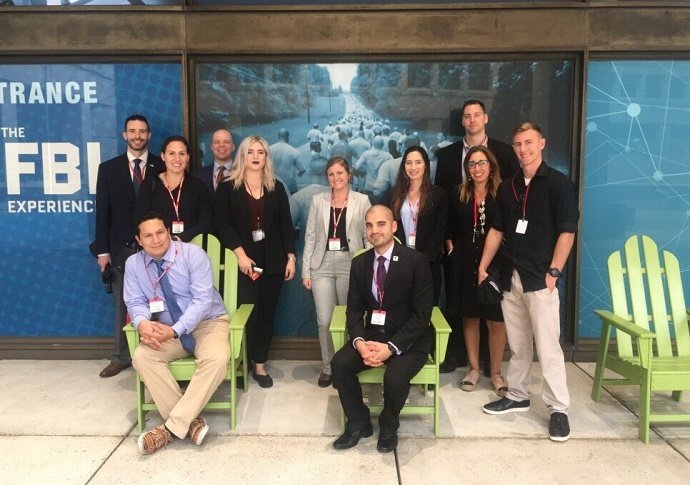 Arranged by the OVMA Veteran Career Services team, Syracuse University student veterans participated in a four-day immersion trip designed to introduce them to potential employers. Students attended a networking reception to connect with employers and alumni, dinner events hosted by supporters of Syracuse University student veterans and toured the offices of Student Veterans of America, Deloitte, Wounded Warrior Project, the Federal Bureau of Investigation (FBI) and the Office of Personnel Management. Students selected to attend were required to complete a professional development and informational workshop prior to the trip. All trip expenses were fully covered by alumni donations to the Veteran Legacy Fund. The IVMF and OVMA teams, along with a representative from University College, attended the Association of the United States Army (AUSA) Annual Meeting and Expo, a yearly event that draws over 700 exhibitors and 30,000 attendees from more than 100 countries. At the Expo, IVMF hosted V-WISE IGNITE, a one-day entrepreneurship training event for women veterans, active duty service women and women military spouses/life-partners exploring the opportunity of small business ownership as a post-service career path. Other members of the IVMF team were in the D.C. area hosting an annual Onward to Opportunity (O2O) national meeting at Boeing headquarters in Arlington, Virginia. O2O stakeholders, participants, federal government representatives, program leaders and employer partners gathered for a year-in-review showcasing impact, challenges and lessons learned across the veteran employment landscape. The O2O program provides free career preparedness training for service members leaving the military, veterans, and military spouses. To date, O2O has equipped 20,000 participants with high-demand career training and certifications, all of whom joined the ranks of Syracuse alumni upon graduation. While in Washington, the IVMF team hosted an “all-IVMF” alumnus networking social where program alumni in the D.C. area, as well as those attending IGNITE and the O2O meeting, gathered to network, get updates on University and IVMF programs and engage with some of the now 100,000 IVMF program participants.